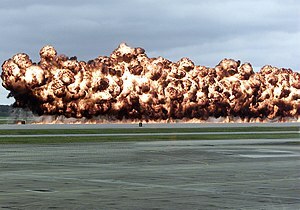 A simulation of a napalm explosion at an air show in 2003. Inside the bomb is a mix of napalm-B - f and gasoline. Napalm is the name for a number of flammable liquids that have been used in warfare. Often it is jellied gasoline. Napalm is actually the thickener in such liquids. When it is mixed with gasoline, the thickener makes a sticky incendiary gel. It was developed by the U.S. in World War II by a team of Harvard chemists. The team leader was Louis Fieser. The name napalm has comes from the ingredients that were first used to make it: coprecipitated aluminum salts of naphthenic and palmitic acids. These were added to the flammable substance to cause it to gel. One of the major problems of early incendiary fluids (such as those used in flamethrowers) was that they splashed and drained too easily. The U.S. found that flamethrowers that use a gasoline gel are able to shoot farther and are more useful. Gasoline gel was difficult to manufacture because it used natural rubber, which was in high demand and expensive. Napalm provided a far cheaper alternative. It solved the problems involved with rubber-based incendiaries. Nowadays, napalm is mostly made of benzene and polystyrene, and is known as napalm-B. Napalm was used in flamethrowers and bombs by the U.S. and Allied forces, to increase the usefulness of flammable liquids. Napalm is made to burn at a specific rate and stick to materials. This is done by mixing different of amounts of napalm and other materials. Another useful (and dangerous) effect, primarily involving its use in bombs, was that napalm "rapidly deoxygenates the available air." It also creates large amounts of carbon monoxide causing suffocation. Napalm bombs were also used in the Vietnam War to clear landing zones for helicopters. Though napalm was a 20th century invention, it is part of a long history of incendiary materials in warfare. However, historically, it was primarily liquids that were used (see Greek fire). An infantry-based flammable liquid fuel weapon, the flamethrower, was introduced in World War I by the Germans, variations of which were soon developed by other sides in the conflict. On July 17, 1944, napalm incendiary bombs were dropped for the first time by American P-38 pilots on a fuel depot at Coutances, near St. Lô, France. Napalm bombs were first used in the Pacific Theatre during the Battle of Tinian by Marine aviators. Its use was complicated by problems with mixing, fusing and the release mechanisms. In World War II, Allied forces bombed cities in Japan with napalm, and used it in bombs and flamethrowers in Germany and the Japanese-held islands. It was used by the Greek army against communist guerrilla fighters during the Greek Civil War, by United Nations forces in Korea, by Mexico in the late 1960s against guerrilla fighters in Guerrero and by the United States during the Vietnam War. The most well-known method of delivering napalm is from air-dropped incendiary bombs. A lesser-known method is the flame throwers used by combat infantry. Flamethrowers use a thinner version of the same jellied gasoline to destroy gun emplacements, bunkers and cave hideouts. U.S. Marines fighting on Guadalcanal found them very effective against Japanese positions. The Marines used fire as both a casualty weapon as well as a psychological weapon. Men have a natural fear of fire. They found that Japanese soldiers would abandon positions in which they fought to the death against other weapons. Prisoners of war confirmed that they feared napalm more than any other weapon thrown at them. Napalm became one of the preferred weapons of the Korean War. Pilots returning from the war zone often remarked they would rather have a couple of gasoline tanks full of napalm to drop than any other weapon, bombs, rockets or guns. The U.S. Air Force and Navy used napalm with great effect against all manner of targets to include troops, tanks, buildings and even rail road tunnels. The demoralizing effect napalm had on the enemy became apparent when scores of North Korean troops began to surrender to aircraft flying overhead. Pilots noted they saw surviving enemy troops waving white flags on subsequent passes after dropping napalm. The pilots radioed to ground troops and the North Koreans were captured. Napalm has been used recently in wartime by or against: Iran (1980–88), Israel (1967, 1982), Nigeria (1969), Brazil (1972), Egypt (1973), Cyprus (1964, 1974), Argentina (1982), Iraq (1980–88, 1991, 2003 – ? ), Serbia (1994), Turkey (1963, 1974, 1997), Angola, United States. In some cases, napalm disables and kills its victims very quickly. Those who do survive suffer up to 5th degree burns. These damage parts of the skin which do not have pain receptors. However, victims who suffer 2nd degree burns from splashed napalm will be in significant amounts of pain. "Napalm is the most terrible pain you can imagine," said Phan Thị Kim Phúc, a napalm bombing survivor known from a famous Vietnam War photograph. "Water boils at 100 degrees Celsius. Napalm generates temperatures of 800 to 1,200 degrees Celsius." Phuc had third-degree burns to half her body and was not expected to live. But thanks to assistance from South Vietnamese photographer Nick Ut, and after surviving a 14-month hospital stay and 17 operations, she became an outspoken peace activist. International law does not prohibit the use of napalm or other incendiaries against military targets, but use against civilian populations was banned by the United Nations' inhumane weapons convention (often referred to as the CCW) in 1981. Protocol III of the CCW restricts the use of incendiary weapons (not only napalm), but a number of states have not acceded to all of the protocols of the CCW. According to the Stockholm International Peace Research Institute (SIPRI), states are considered a party to the convention, which entered into force as international law in December 1983, if they ratify at least two of the five protocols. The United States, for example, is a party to the CCW but did not sign Protocol III. An Ecuadorian air force IAI Kfir aircraft drops napalm on a target range during the joint US and Ecuadorian Exercise BLUE HORIZON. These bombs did not actually have napalm in them. The napalm-B (super napalm) used in Vietnam was gasoline based. The Mk-77 firebombs used in the Gulf were kerosene based. It is, however, a napalm-like liquid in its effect. Recipes how to make napalm-like substances can be found on the Internet. Very often, the recipes say that they will make a thick substance using gasoline, with soap or polystyrene as a thickening agent. However, inexperienced people following these instructions often handle the substance improperly and cause accidents. In addition, making incendiary devices is illegal in many countries. Napalm bombs explode after being dropped from a Republic of Korea Air Force F-4E Phantom II aircraft during a live-fire exercise. Napalm is usually a mixture of gasoline with suitable thickening agents. The earliest thickeners were soaps, aluminum, and magnesium palmitates and stearates. Depending on how much thickener is added, the resulting viscosity may range between syrupy liquid and thick rubbery gel. The content of long hydrocarbon chains makes the material highly hydrophobic (resistant to wetting with water), making it more difficult to extinguish. Thickened fuel also rebounds better from surfaces, making it more useful for operations in urban terrain. There are two types of napalm: oil-based with aluminium soap thickener, and oil-based with polymeric thickener ("napalm-B"). The United States military uses three kinds of thickeners: M1, M2, and M4. The M1 Thickener (Mil-t-589a), chemically a mixture of 25% wt. aluminum naphthenate, 25% aluminum oleate, and 50% aluminum laurate, (or, according to other sources, aluminium stearate soap) is a highly hygroscopic coarse tan-colored powder. As the water content impairs the quality of napalm, thickener from partially used open containers should not be used later. It is not maintained in the US Army inventory any more as it was replaced with M4. The M2 Thickener (Mil-t-0903025b) is a whitish powder similar to M1, with added devolatilized silica and anti-caking agent. The M4 flame fuel thickening compound (Mil-t-50009a), hydroxyl aluminum bis(2-ethylhexanoate) with anti-caking agent, is a fine white powder. It is less hygroscopic than M1 and opened containers can be resealed and used within one day. About half the amount of M4 is needed for the same effect as of M1. A later variant, napalm-B, also called "super napalm", is a mixture of low-octane gasoline with benzene and polystyrene. It was used in the Vietnam War. 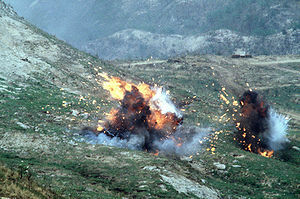 Unlike conventional napalm, which burns for only 15–30 seconds, napalm B burns for up to 10 minutes with fewer fireballs. It also sticks better to surfaces, and offers improved destruction effects. It is not as easy to ignite. This reduces the number of accidents caused by soldiers smoking. When it burns, it develops a characteristic smell. Starting in the early 1990s, various websites including The Anarchist Cookbook advertised recipes for homemade napalm. These recipes were predominantly equal parts gasoline and styrofoam. This mixture closely resembles that of napalm-B, but lacks a percentage of benzene. Napalm reaches burning temperatures of approximately 1,200 °C (2,200 °F). Other additives can be added, e.g. powdered aluminium or magnesium, or white phosphorus. In the early 1950s, Norway developed its own napalm, based on fatty acids in whale oil. The reason for this development was that the American-produced thickening agent performed rather poorly in the cold Norwegian climate. The product was known as Northick II. Napalm itself became well known by the American public after its use in the Vietnam war. Since then, it has been mentioned in the media and arts multiple times. This summary is not meant to be all inclusive. In the film Apocalypse Now, assault helicopter pilot Colonel Kilgore (Robert Duvall) famously declares "I love the smell of napalm in the morning... It smells like... victory." In the American newspaper comic Calvin and Hobbes, Calvin's favorite comic book superhero (and a character he wants to become) is Captain Napalm. To add an aspect of irony (especially when considered with the usage of napalm in Apocalypse Now), the tagline for Captain Napalm is "Defender of the American Way". In the film An Officer and a Gentleman, Sgt. Foley (Louis Gossett, Jr.) leads a quick-step march with a cadence call that has the chorus, "And napalm sticks to kids! ", a real U.S. Air Force cadence call at the time. In the film Fight Club, the screenwriters were originally going to have Tyler Durden (played by Brad Pitt) recite a working recipe for napalm. However, after questions of safety were brought to the attention of the producers, they substituted his lines with a fake recipe claiming it to be equal parts of gasoline and orange juice concentrate. Contrary to popular belief, the original recipes in the Fight Club book were also modified by its publisher. The book's altered recipes claim that, in addition to orange juice, mixing equal parts gasoline and diet cola, or thickening gasoline with cat litter, will work. In the 1973 Japanese kaiju film Godzilla vs. Megalon, the enemy Megalon, was shown to be able to spit napalm bombs that explode on contact. There is a metal band called Napalm Death. ↑ 1.0 1.1 1.2 1.3 1.4 1.5 1.6 "Napalm". www.globalsecurity.org. ↑ 5.0 5.1 Elizabeth Omara-Otunnu. University of Connecticut Advance. Napalm Survivor Tells of Healing After Vietnam War. November 8, 2004. ↑ "MK-77 - Dumb Bombs". www.globalsecurity.org. ↑ "Chuck Palahniuk - Author of Fight Club". www.dvdtalk.com. The Simple English Wiktionary has a definition for: napalm. This page was last changed on 11 February 2019, at 20:16.